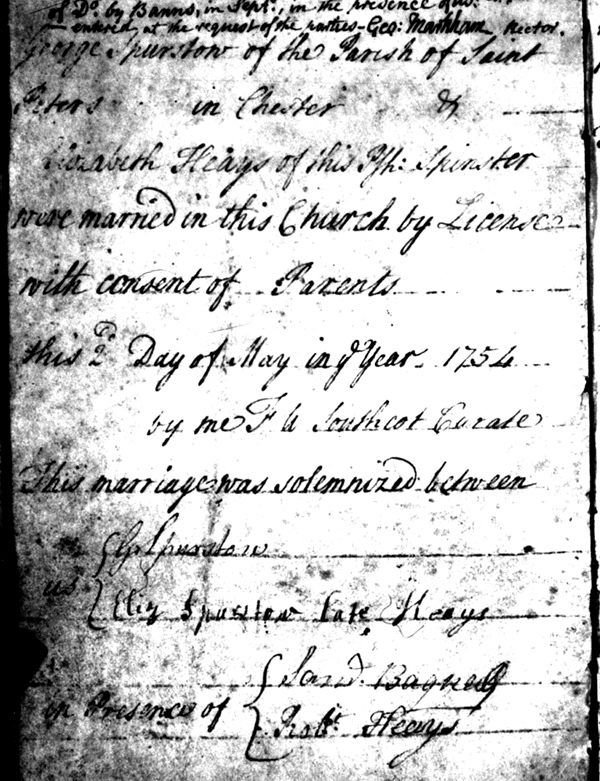 Copy of parish marriage record for George Spurstow and Elizabeth Hayes (Heays), 2 May 1754, Tattenhall, Cheshire, England. George was the son of John Spurstow and Elizabeth Illidge and Elizabeth was the daughter, supposedly, of George Hayes and Elizabeth Bagnell. They were married by license with parental consent. "George Spurstow of the Parish of St. Peters in Chester, & Elizabeth Heays of this Psh., spinster, were married in this church by License with consent of Parents this 2d day of May in the Year 1754 by me F. A.? southcot, Curate." The witnesses were Saml. Bagnell and Robt. Heays. The parish church was St. Alban's. Parish registers: Parish Church of Tattenhall, Cheshire, England, 1654-1947, FHL MF 2068755, marriages 1654-1762. Photographs and web page content, Copyright © 2002- , Anne Field, all rights reserved.